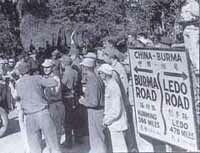 Ships Log "Left Kunming, down the Burma Road by truck, destination Lashio 1250 Km. 1st Lt of 07 Sub-Lt Gee left in Kunming to be taken by plane to Chungking for Cipher work in British Embassy. The convoy proceeded down the Burma Road, the only overland route into and out of China,where the US Lend-Lease supplies came in for the embattled Chinese government of Generalissimo Chiang Kai-shek in their fight against the Japanese and Communists. Lt Kennedy RNVR "We were ready to leave and Gandy warned us to keep a good look-out for aircraft on the next stage. Apparently the Japanese-controlled radio at Bangkok had announced that the British party which had escaped from Hong Kong would never get out of China. The party soon began to regret having swapped their Chinese padded jackets with the commando's for shirts and shorts as they climbed steadily higher and higher. The road peaked at over nine thousand feet (2743m) with heavy frost. The views over the plains below were stunning and kept the party in a jovial mood. The overnight stops were a trial in itself with little or no electricity and primitive communal amenities. Ships Log "Left Tsuyang at daylight. Stopped for a meal at Tummanyi 327 Km from Kunming after passing over Tien Tzu Mias? Pass 7,800 feet. Dusk arrived at Siakuan (411 Km from Kunming) for night. Siakuan suburb of Dali, unique amongst historic cities of China. From 738 to 938 AD Capitol of an independent Shan? Kingdom. Back in Chengdu David MacDougall was recovering from his operation. David MacDougall MoI "I had a hellish four days after the operation, and had to have a lot of morphia, but I’m all right now; am getting up part of the day and eating like a horse. While at Xiaguan some managed to visit Dali in Yunan Province to see the monastery by the lake. To their surprise they came across an English church, which came under the diocese of the Bishop of Hong Kong some seven hundred miles to the south east. It was also very noticeable that the people here were darker skinned, taller and more central Asia looking than the traditional Chinese. Ships Log "Left Siakuan 06.45. Arrived Wai Yao 613 Km from Kunming 18.30. Lt Kennedy RNVR "And finally the majestic flood of the river Mekong. The Chinese had built two suspension bridges over this formidable obstacle to prevent a single bomb from severing the road completely. Two HKRNVR officers D F Davies & D W Morley who had escaped with Colonel Lindsay Ride from Shamshuipo POW camp arrived at the Ho Sai Mission in Kukong.. Ships Log "06.50 Left Wai Yao? -crossed Salween River-gorge 1 mile deep. 18.30. Arrived Lo Mang 780 Km from Kunming. 18.10 arrived Wantung, now Wandingzhen. 18.38 crossed border into Burma. Contacted members of Burma control Service & Burma Frontier Force. They were now at the end of the north-east Monsoon season which tends to be dry and mild. 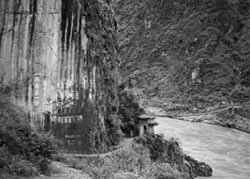 Lt Kennedy "It was a distinct thrill to be back on British territory again after travelling for over six weeks, and we were well looked after at the quarters of the Burma Frontier Force. PO Buddy Hide "On the whole of this journey the hospitality of the Chinese was wonderful. We were passing through the poorest part of the interior of China, but whatever place, no matter how large or small, the people gave us the best they could, of course it was all Chinese Chow, poor class Chinese Chow, which is all rice boiled dry, no milk or sugar, and sufficient meat for one Englishman was shared amongst ten of us; the same with the greens, which was nearly all garlic. On the Burmese side of the border the party were met by British border guards and more trucks, this time supplied by Dodwell and Co, the International Trader & Shipping Agent that Lt Ashby had worked for as head of their motor division importing American Chrysler trucks and armoured cars, etc. for supply to the Chinese National Govt. Lt Kennedy "I have been a sort of Marco Polo in reverse. The Chinese could not do enough for us. We were feted right across China. It was a distinct thrill to be back on British territory again after travelling for over six weeks, and we were well looked after at the quarters of the Burma Frontier Force. 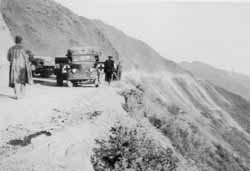 The Dodwell trucks took them another hundred miles to the Burma Road terminus at Lashio, where they were billeted in a near deserted RAF camp and entertained with good food and facilities. Left: Lt Ron AShby standing next to a Dodwell truck at the Burma border. Eve Currie arrived in Lashio on the evening flight from Calcutta and got a taxi straight to the Commissioner, Mr Porter's house, where she had her first of several encounters with Cdr Gandy RN and the escape party..
Lashio was a very cosmopolitan town divided between the old & the new where supplies were stockpiled for onward transport into China. Eve Curie "New Lashio, the centre of the boom city where the Burma Road started. Six or seven different languages and dialects could be heard, spoken by Burmese, Shan, and Chin customers, primitive-looking peasants from the remote hill tribes, Chinese truck drivers, and white men, English and American, who worked on the road in some capacity or other. Lt Kennedy "During the day we were allowed to go into the new town, but at night it was out of bounds owing to bubonic plague. He (Parsons) had been determined to lead the boys home after a visit to the Lashio Club, and had vanished in the darkness down a slit-trench. Due to the overwhelming mass of refugees fleeing Rangoon the trains time tables were running hours late. Lt-Cmd Yorath RN was suffering with severely infected sinuses and was left in the hospital along with Lt Parsons. They were both flown out to Calcutta after recuperating. Word had preceded the party to the hilltop station and at Maymyo they were hijacked by members of the Bush Warfare School commanded by Brigadier Michael Calvert. Mad Mike as he was known had served in Hong Kong prior to his posting to Burma where he set up The Bush Warfare School and trained irregular forces in the art of ungentlemanly warfare. Ships Log "11.15 Arrived Maymyo - whole party including Lt-Cmd Gandy taken off train by Commando guards & entertained at Bush Warfare School. Lt Kennedy RNVR "At Maymyo, the last stop before the line left the hill country for the plains, we were invited by the army to lunch at the Bush Warfare School, where new methods of fighting were being studied to counter Japanese tactics. L/S Les Barker "Arrived at Maymyo at 1 pm. Had dinner with British soldiers then proceeded to Mandalay by lorry. 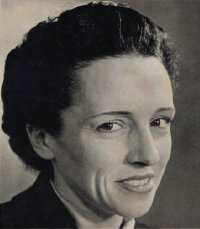 Eve Curie, a Polish born French American author, concert pianist, journalist, diplomat and now a war correspondent, working for the "New York Herald Tribune" and "Allied Newspapers", London had caught the train at Lashio, on arrival at Mandalay she alighted from the train to stretch her legs in the late afternoon sun and witnessed Lt-Cmd Gandy RN and his party arrive by truck to continue their journey south to Rangoon. Eve Currie's account of her second brief encounter with the escape party was published in the British press two weeks later. "Waiting for a train was a naval officer in command of motor torpedo boats. He was travelling with 43 officers and men of his unit. All of them had escaped from Hong Kong across Japanese-occupied territory, getting constant help from Chinese guerilla fighters and local Chinese inhabitants. They had fantastic stories to tell but told them reluctantly. They seemed to be solely interested in rushing south and getting hold of new motor torpedo boats and fighting the Japanese again. "The platform was crammed with Burmese men and women smoking cheroots, some of them squatting on their heels in a posture that seemed almost accrobatic to me, but which they could keep for hours. There were barefoot children, begging, very old men in rags, with very long grey hair, who looked like witches, also begging, English and Indian soldiers in uniform, and bearded Indian civilians wearing huge turbans and white cotton clothes.